Most of us are all familiar with the story of David & Goliath in 1 Samuel 17. I. The battle between the Palestinians and the Israelites was a spiritual one. II. David had the Holy Spirit just as all of those who belong to God have access to. III. David recognized the battle was spiritual even though everyone around him could not. He was walking in the spirit, not by sight, but by faith. IV. When David faced the giant, he knew the battle was not a man against a giant, but a giant against the power of God. V. The battle was the Lord’s! David had the right perspective. We must remember these points in our lives as well when we face things. Those who live according to the flesh have their minds set on what the flesh desires; but those who live in accordance with the Spirit have their minds set on what the Spirit desires. 6 The mind governed by the flesh is death, but the mind governed by the Spirit is life and peace. 7 The mind governed by the flesh is hostile to God; it does not submit to God’s law, nor can it do so. 8 Those who are in the realm of the flesh cannot please God. We wrestle not against flesh and blood, the battle is Spiritual and the battle is the Lords. I. 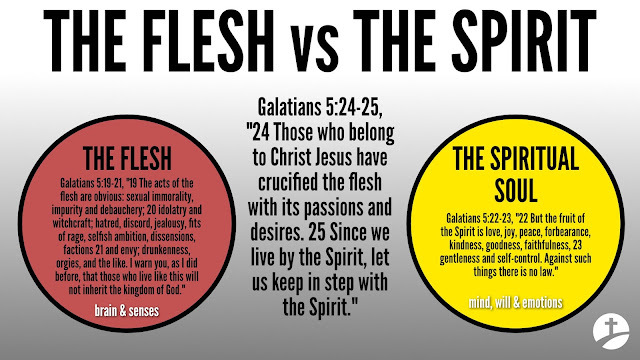 WHAT IS OUR “FLESH”? a. Today we are talking about our flesh. More specifically the battle between our flesh and our spirit. i. I took creative writing in school, and there were three major themes we saw repeated in novels. man-against-nature, man-against-man, and man-against-self. ii. Like many a great books, one of the plots that intrigue us as human beings is man-against-self. iii. We live “man-against-self” everyday as a Christian. iv. This is why we need to win the war within our minds. v. As the scriptures say; to take every thought into captivity of Christ Jesus. vi. The battle is in our minds. Not to say that it does not exist, but that it exists and lives in our minds! b. Here is something very interesting, when we accept Jesus Christ, our souls are redeemed. i. BUT, our flesh is not! Our flesh is not redeemed when we become Christians. We are redeemed souls living in corrupt flesh. 1. Have you never wondered why even though you accept Christ, you are still going to die and you are going to receive glorified bodies? ii. God will never contradict His Holy Word. 1. God warned Adam that if he ate of that tree he would surly die. 2. The scriptures say that it is appointed to man to die once. iii. Our flesh has been cursed because of sin. iv. When Adam sinned, when he chose unrighteousness over righteousness, when he behaved in fear instead of love, God’s spirit was severed from Him. 1. Adam could have behaved in love for God and His Word. 2. Love for his wife, knowing that God warned not to eat of the tree. 3. But he behaved in fear, perhaps fear of rejection from his wife. c. Relationship & communion with God was broke because of sin, and the spirit of God which sustained Adam and Eve was removed. i. From this point on, food would sustain them, but only for a time. 1. Their flesh must be returned to the dust. This is the curse. ii. When we make Jesus Christ our Lord and Savior, we return to relationship with God the Father. 1. Our souls are redeemed through the Holy Spirit. 2. But our flesh must return to the dust as the Lord has said. a. So our flesh is cursed even after we accept the Lord. i. This is why when we become Christians, we struggle with our flesh. 1. As the scripture says, it is a constant battle between what our redeemed soul led by the spirit of God WANTS to do, and what our corrupt flesh led by worldly desires wants to do. b. This is why we are told to walk in the spirit, because although we have accepted Christ and are redeemed, we can still walk in the flesh. ii. It’s easy to act in unrighteousness. iii. Jesus said, “...wide is the road that leads to corruption...”, This is the act of walking in the flesh (living by the flesh). iv. He said, “Narrow is the path (the way, the Truth and the life) which is only found in Christ Jesus. This is the act of walking in the Spirit, living by the Spirit. c. King David is a perfect example. i. He received the Holy Spirit at a young age, and yet, gave into his flesh and sinned with Bathsheba. ii. We put our trust in people, in ourselves, in flesh. iii. We depend on people, on others, on ourselves for getting things done. iv. Flesh is not our strength, but our weakness. v. For the flesh of man is not redeemed, but cursed. vi. David “chose” to follow his flesh and its desires, and sinned against God, although He had the Holy Spirit of God, he abandoned God, turned away from Him. If David would not have confessed and repented of his sin, he would have been in danger of dying in that sin. III. IS IT POSSIBLE TO LIVE RIGHTEOUSLY IN UNREDEEMED FLESH? i. YES!, absolutely! !, righteous living is obtained through walking in the Spirit of God. 1. It is in my weakness He (the Lord) is my strength! b. Romans warns against becoming prideful, arrogant, boastful or self-righteous about our flesh and its abilities apart from God’s Spirit. i. We all sin and fall short of the Glory of God. 1. But we don’t have to stay in that sin. 2. If we recognize our sin, confess to the Lord and repent then we can have forgiveness, and mend our relationship with God. ii. If we continue to live in sin, or unrighteousness, we are choosing to separate ourselves from relationship with the Lord. 1. It is NOT God that fails us, rather we fail Him! iii. The scriptures say the Lord does not hear the prayers of the unrighteous. 1. This is a very important scripture to remember. 2. We must call on His name and repent! c. When we walk in the flesh instead of the spirit, we are living in unrighteousness, and God cannot hear us. i. Save but one prayer, Lord forgive me. ii. Forgiveness only comes through confession to the Lord and repentance. That's it. IV. SO HOW DO WE “WALK” IN THE SPIRIT? a. How do we live righteously? i. How do we choose love over fear? ii. Believers have the Spirit of Christ, the hope of glory within them. iii. Those who walk in the Spirit will show forth daily, moment-by-moment holiness. iv. And if we slip and fall occasionally onto the broad path, if we are in the Word, we recognize this, confess, repent, and we get back on our feet and continue forward in righteousness. v. This is brought about by consciously choosing by faith to rely on the Holy Spirit to guide us in thought, word, and deed. “11 In the same way, count yourselves dead to sin but alive to God in Christ Jesus. 12 Therefore do not let (CHOICE) sin reign in your mortal body so that you obey its evil desires. 13 Do not offer (CHOICE) the parts of your body to sin, as instruments of wickedness, but rather offer yourselves (CHOICE) to God, as those who have been brought from death to life; and offer the parts of your body to him as instruments of righteousness. (CHOICE) 14 For sin shall not be your master, because you are not under law, but under grace. vi. We can know that we are walking in the Spirit if our lives are showing forth the fruit of the Spirit which is love, joy, peace, patience, kindness, goodness, faithfulness, gentleness, and self-control (Galatians 5:22,23). vii. Being filled (walking), with the Spirit is the same as allowing the Word of Christ to richly dwell in us. b. The result of being filled with Christ is thankfulness, singing, and joy. i. Children of God will be led by the Spirit of God (Romans 8:14). c. When Christians CHOOSE not to walk in the Spirit, thereby sinning and grieving Him, provision has been made for restoration through confession of the wrongdoing and repentance. i. To “walk in the Spirit” is to follow the Spirit’s leading. ii. When the devil tempted Jesus, He tried to tempt His flesh, His human side, underestimating and not understanding that the righteous have the Holy Spirit, and the Holy Spirit of God is beyond tempting, and stronger than anything because it is God. It is essential to “walk with” the Spirit, allowing Him to guide our steps and transform our minds. Just as we have received Christ by faith, by faith He asks us to walk with Him, in His Holy Spirit, until we are taken to heaven and will hear from the Master, "Well done!" (Matthew 25:23). If you are at war with your flesh, your mind, sin, unrighteousness, come forward today, and I will pray for you. Walking in the spirit is possible, and living a fruit bearing life is possible, being righteous is possible, all through walking with the Lord.